by Boris Hegenbart and Volker Straebel. At Collegium Hungaricum Berlin in commemoration of “Kristallnacht” on November 9th, 1938. Based on the belief that the persecution of the Jews and the Holocaust cannot be represented in narrative accounts, and that an atmospheric or illustrative approach to the pogrom of November 9th 1938 results in the trivialization of this genocide and injures the dignity of its victims, we have created a sound installation which conceptually focuses on empty space, that the extermination of Jews and other groups has left in the life of European nations. 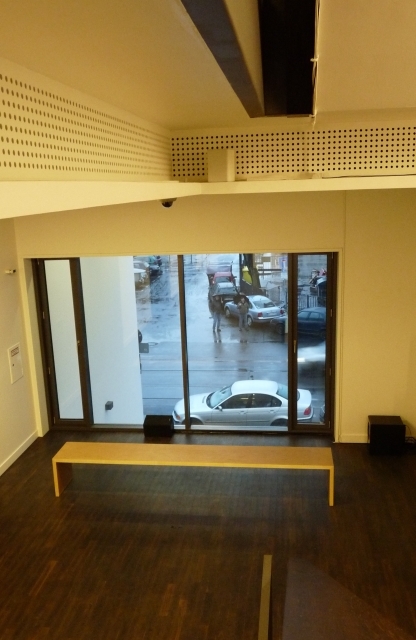 The sound installation in the interior of the Collegium Hungaricum Berlin consists of two parts: one two-channel installation in the south window of the stairway of the ground floor and a six-channel installation directly on the stairs on the first, second, and third floors. Through the south window located directly at the entrance on the first floor there is a view onto Dorotheenstraße. The street noises can be heard through loudspeakers. From this sound material, one to three small frequency sound-bands are filtered out. An acoustic empty space is produced. This alludes to the evictions and attrition of the Holocaust. The frequency bands that are filtered out live from the street, change over time. They come from an extremely slowed-down counterpoint study derived from a piece written by Arnold Schönberg in exile in California on November 10th, 1938, the so-called “Kristallnachtfuge”. In the staircase area on the other hand, the frequency bands play back the sounds from Dorotheenstraße which had been filtered out. In this way, the first voices can be heard on the first floor, the second on the second floor, and the third on the third floor. 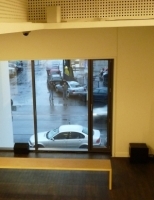 The filters in this section of the installation are as carefully selected as those at the south window on the first floor, so that these disembodied voices sound like sinus-tones. The location of these voices cannot be traced. In relation to the ongoing street sounds, these become articulated and modulate in volume. The transitions and interactions between the three voices/levels are noticed by the visitor while they move through the stairway. Outside we create empty space in a visual way. 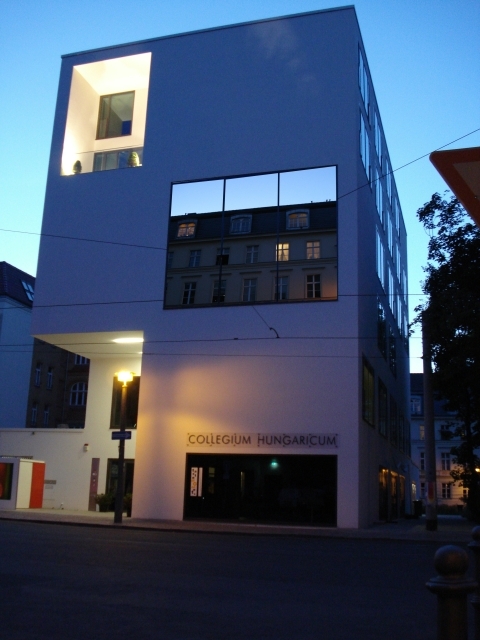 On the levels of the second and third floors on the south façade of the Collegium Hungaricum Berlin there is a large panoramic window which can be used as a video screen via a reverse projection. 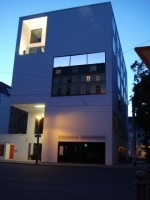 Here a live video signal will be transmitted, which comes from a camera, which is directed out of a window on the north face of the building, towards a row of houses on Bauhofstrasse. This produces a visual opening on the south façade, which enables the viewer to look through and into the building.